OCALA, FL. (Sunday, Feb. 8, 2015) – Kerry Madsen made it look easy the first two nights of the University of Northwestern Ohio All Star Circuit of Champions visit to Bubba Raceway Park as he roared to the victories. However, the third night proved not to be so easy, but the outcome was the same. The Madman would lead 29 of the 30 laps and record his third straight victory. Madsen’s three wins moves him atop the win total for All Star races at Bubba with 4 career victories…all in a row as he won the last series race at the track. It is his sixth overall All Star win. Madsen, with his Brian Morrison horsepower, made a fantastic move in lapped traffic with five to go to retake the lead from Chad Kemenah, who had used the traffic to drive into the lead the previous lap. “All weekend I’ve been running a real nice line and it’s worked well. Tonight it just wouldn’t work. It got real gritty up there so I just kind of figured no one was going to go around me up there cause I can’t go around anyone up there so I tried to start and stop it on the bottom. I wasn’t really good at it but I was good enough in one and two. Chad had me clean there and I had one shot around the outside and I took it. That was a tough race,” said Madsen beside his Keneric Racing/American Racing Custom Wheels/Earthex Logistics backed #29. “Lapped traffic was difficult. I couldn’t get through it quite as good as I could the last two nights. You make a decision where someone was running the lap before and they change their line and I was struggling with it. I knew there would be someone on my heels and I wasn’t very good in four. When you’re running like that you’re trying to stay focused and maximize where you are good,” added Madsen. “This is a fun track and I really appreciate the effort Bubba (Clem, track promoter) and Tony (Stewart, All Star owner) put in…especially Tony and all the All Star officials. The crowds have been fantastic and it’s a fun place to be,” concluded Madsen. For Kemenah, who has been reunited with his brother Brian as the Hunter Racing Team mechanic, the strong second place run is a shot in the arm as the team heads to Volusia Speedway Park. “It was a blast. Kerry did what he had to do. I got by him there and the lapped cars got pretty confusing sometimes but I’m not complaining. This feels great to be a race car driver rather than an owner…I can’t thank Rob and Rita Hunter enough and my brother and everybody sticking behind me. There’s a lot of people out there who probably think I can’t drive any more. I hope there was some people watching. I’m getting more and more comfortable every race with my brother and I hope we can keep going better and better. We’re going to get one before we leave Florida,” said Kemenah beside his Seneca Energy/Night Hawk Holdings/Brilex LLC backed #10h. “I want to thank J&J, Kistler Engines…Paul builds a hell of a power plant…man this thing runs…it showed in qualifying,” added Kemenah. For the second straight night Steve Kinser would bring his Tony Stewart-Curb Agajanian Motorsports #11 home in third though he and Kemenah battled several laps for the runner-up spot. “We went backwards there early in the race and lost three or four spots then we got going pretty good. Sort of got trapped where I didn’t want to be at the start of the race and then got by Chad and shouldn’t have let him slip back by. I thought I had him and I got into one a little too slow and he got back by me. I was trying to catch the bottom there and I would have been better off to motor it right on in there. All in all I had a chance and just didn’t get it done,” said Kinser of his Bad Boy Buggies backed machine. “It’s a pleasure just driving now. The past four years I’ve been taking care of the car and now it’s being taken care of at his (Tony Stewart) shop and I just show up and drive. I don’t have to worry about the guys working on the car and payroll. He let me run the team as I wanted to. I told him I didn’t want to run much more and he said why don’t you just run it out of my shop and I said that sounded like a good deal,” added Kinser..
Tim Shaffer and Madsen would bring the field to green for the 30 lap feature with Madsen gaining the advantage as Danny Holtgraver had a tremendous drive into second with Shaffer back to third followed by Dale Blaney, Kemenah and Steve Buckwalter in tow. Shortly after two laps were scored Tyler Clem and Brent Matus would spin in turn four to bring out the caution. On the restart Madsen would pull away from Holtgraver as Kemenah powered to third with Blaney, Shaffer and Buckwalter giving chase. Kemenah would take second on lap six just as the caution would fly for a Caleb Armstrong spin. Armstrong would spin again on the restart. When the green flew again the race would go to the end without a stoppage. Madsen appeared to be comfortably on his way to the win until he encountered heavy lapped traffic on lap 12. Kemenah slowly ate into the Mad Man’s lead with Kinser also closing. By lap 17 Kemenah had his hands full with Kinser as they tried to chase down Madsen. With eight laps to go the leaders were in heavy lapped traffic again and Kemenah and Kinser were within a couple of car lengths of Madsen who was struggling in turn four. Coming to the line to complete lap 24 Kemenah shot off the bottom of turn four, split a lapped car and took the lead. But, going into turn one, Madsen shot to the outside to regain the top spot. With five laps to go the running order was Madsen, Kemenah, Kinser, Blaney and Holtgraver. Madsen would clear the traffic and would drive to the win over Kemenah, Kinser, Blaney, Holtgraver, Shaffer, Wayne Johnson, Lucas Wolfe, Buckwalter and Parker Price Miller. The UNOH All Stars now head to Volusia Speed Park located near Barberville, Florida for racing on Wednesday, Feb. 11 and Thursday, Feb. 12 as part of the DIRTcar Nationals. Volusia Speedway Park is located at 1500 East State Road 40, Deleon Springs Florida. Event information is available by calling 1-704-795-7223 or visit www.dirtcar.ticketforce.com. 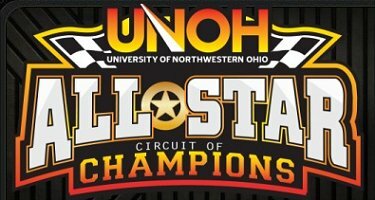 The UNOH All Star Circuit of Champions Sprint Car Series is the original winged sprint car tour. Follow the All Stars during their 50 plus race season on Twitter.com/@ASCoC, www.facebook.com/AllStarCircuitofChampions and www.Instagram.com/AllStarSprints using the hashtag #TheNewAllStars. An all new website has been launched at www.AllStarSprint.com. FREMONT, Ohio (Saturday, Sept. 13, 2014) – The numbers just keep piling up for Dale Blaney. The four time University of Northwestern Ohio All Star Circuit of Champions titlist would drive to the $10,000 payday on JLH General Contractor Night for the 7th Annual Jim Ford Classic at Fremont Speedway Saturday. Blaney would sweep the two-day event at “The Track That Action Built.” It was his 15th UNOH All Star win of the season and runs his career total to 114. Blaney has five wins in 2014 at Fremont to take his career total at the track to 24, moving him into a tie with John Beaber for 19th on the track’s all-time win list. It was the 116th appearance of the UNOH All Stars at Fremont and Blaney leads all drivers in career series wins at the track with 18. “Chris (Andrews) was really good in the dash. I really thought he was going to be the guy to beat. But we got rolling really good around the top and he was struggling through the middle a little bit and I was gaining some ground on him. Man this car just got better and better and I could put it anywhere I wanted,” said Blaney beside his Kennedy Cattle/Ti22 Performance/Penske Shocks/Gf1 Chassis backed machine. “George Fisher (crew chief) is unbelievable. I’ve worked with him for 12 years now and we’re going good and I’m proud of everybody. Skippy and Donnie and Ricky Jr….we have a lot of guys that put in a great effort and it shows,” added Blaney. Castalia, Ohio’s Jordan Ryan, who recently earned the 2014 track championship at Attica Raceway Park, is looking to do the same at Fremont Speedway. Ryan held off a charging Jamie Miller and made some daring moves in lapped traffic to score his fourth win of the season in the Fremont Federal Credit Union 305 Sprints. It was Ryan’s 5th career win at Fremont Speedway. “I knew someone (Miller) was outside of me…I just couldn’t get past the 2 car (Ricky Peterson). He kept going to the bottom and it was a little slimy down there and it was hard to pass him,” said Ryan beside his J&J Automotive/Griff’s Engines/Frost Frog/Kistler Racing Products/Village Pizza House/backed #5. At one point Ryan had built a five second lead but it was wiped out by a caution on lap 11. “I didn’t realize I had that big of a lead. My dad kept giving me the middle sign…but I looked up on the sign and saw the 6 (Dustin Dinan) there and I knew I had to keep my momentum up. I watched Dale Blaney all night and how he ran the middle and I tried to mimic him…it worked out,” added Ryan. Shawn Valenti has been unstoppable at Fremont in 2014 in the AAA Ohio Auto Club Dirt Trucks. The Risingsun, Ohio driver took the lead on lap five and dominated the rest of the feature for his third consecutive win. The victory is the 13th of the season at Fremont for Valenti and gives him 22 for his career and moving him into a tie for 24th on the track’s all-time win list. “It’s just been one of those dream years. I didn’t want to let Dale (Blaney) be the only one to sweep the Jim Ford weekend. I know this thing was hooked up tonight. Awesome job by Rich Farmer and the crew on the track. I want to thank the fans for sticking around to watch us tonight,” said Valenti of his Craig Miller Trucking/KS Sales and Service/Day Dream and Memories Crafts and Antiques/Gressman Powersports/Dave Story Equipment Repair/Conrad Transportation backed #7B. Andrews and Rob Chaney would bring the field to green for the 50-lap feature which honored the late Jim Ford who re-opened Fremont Speedway in 2000, saving it from closing. Andrews would gain the advantage as Blaney would move from third to second. As Andrews and Blaney pulled away, Andrew Palker and Chaney would battle for third with Lee Jacobs, Bryan Sebetto, Tim Shaffer and Caleb Griffith in pursuit. Lee Jacobs would blast into third on lap three just before the caution flew on lap four for a Cap Henry spin. On the restart Andrews and Blaney again pulled away with Jacobs, Palker, Chaney, Shaffer, Sebetto and Griffith giving chase. With six laps in the books, Blaney began to pressure Andrews. On lap eight Blaney would shoot around Andrews going down the back stretch but the caution would fly when Craig Mintz suffered front end damage and stopped on the front stretch. On the restart Andrews and Blaney picked right back up on their battle with Lee Jacobs, Palker, Chaney and Sebetto in tow. Cale Thomas would stop on lap 10 for another caution. And again when the green flew Andrews and Blaney battled for the lead. That duo would wage war over the next seven laps before hitting heavy lapped traffic on lap 16. Blaney would rocket off the bottom of turn three on lap 18 to steal the lead from Andrews with Lee Jacobs, Chaney and Sebetto the running order. Palker’s great run would end on lap 24 when he spun in turn two and that would bring out a red flag fuel stop. When the green flew Blaney had a couple of lapped cars separating him from Andrews while Lee Jacobs, Chaney, Sebetto, Griffith and 17th starter Greg Wilson in pursuit. The caution flew again on lap 28 for a Brian Lay spin. On the restart Henry would tumble on the front stretch; he was uninjured. On the restart Blaney again pulled away from Andrews as Chaney drove around Jacobs for third with Wilson moving into the top five. That top five would not change as they again raced into lapped traffic on lap 37. With 10 laps to go Jacobs began pressuring Chaney for the third spot when he would suffer front end damage on lap 41, ending his run. On the restart Blaney had a two lapped car cushion over Andrews, Chaney and Wilson. Chaney would drive into second on lap 43 but Andrews challenged back with five laps to go. Chaney would finally pull away from Andrews and began closing on Blaney. But, Blaney’s lead was insurmountable and he drove to the victory over Chaney, Andrews, Wilson and Sebetto. “I think there’s a lot of credibility to running second to him. I stayed with Dale last night and I used his car today and I put gas in it and now I wish I wouldn’t have,” joked Chaney beside his Stan Cortad Racing #9x. After leading the first 17 laps and having a bad couple of weeks that saw him miss out on a track title at Attica and the Kistler Racing Products FAST championship, Andrews was happy to finish third. “I tried to take Dale’s advice. I didn’t want to go too hard and then he showed his nose past me and I kind of just followed him and learned a little bit. I got to racing with lapped cars that should have probably just pulled out of the way and let the leaders run a little bit. Seems like we run pretty good at the Jim Ford Classic every year. It makes up for a lot of bad runs here recently and I’m pretty excited,” said Andrews beside his Burmeister Racing/Lucas Oil/K&N Filters/Goofy Golf/Re-elect Judge Anstead/Tender Touch Car Wash/Schiets Motorsports/Kistler Engines/Adkins Sanitation/Applebees Restaurant backed #16. Rookie Luke Griffith and Ryan would pace the field for the 25 lap feature for the 305 sprints with Ryan taking the lead over Griffith, Miller, Dinan, Nate Dussel, Bobby Clark, Josh Harrison, Jason Keckler and Trey Jacobs. Ryan would steadily pull away from Griffith who had his hands full with Miller and Dinan as they raced into lapped traffic by the 7th circuit. Dinan would move into third and steal second on lap eight. With 10 laps in Ryan had built a 10 second lad over Dinan with Griffith, Miller, Dussel, Clark, Jacobs and Harrison in pursuit. A spin by Clay Riney would bring out the caution and wipe out that huge lead. When the green flew Ryan pulled away slightly from Dinan with Miller, Griffith, Dussel, Clark, Jacobs, Steve Rando and 19th starter Alvin Roepke giving chase. Miller would drive into second on lap 13 and slowly ate into Ryan’s lead with Dinan, Dussel, Griffith, Clark, Rando and Roepke in pursuit. With five laps to go the leaders hit heavy lapped traffic and Miller closed to within two car lengths. Ryan made a fantastic move in turns three and four on lap 20, splitting two lapped cars. But, Miller would execute the same move in turns one and two to stay close. As the white flag flew, Ryan was hung up on the bottom by a lapped car and Miller raced to his outside with Dussel, Dinan, Clark and Roepke closing. Ryan was able to hold off Miller for the win with Dussel, Dinan and Clark rounding out the top five. Kyle Cline and Dana Frey brought the field to green for the 20 lap dirt truck feature with Fry leading the first lap over Cline, Cory McCaughey, Gene Potridge, Jeff Ward and Ben Good. Fry and Cline tangled in turn two ending their night after the first lap was completed. On the restart McCaughey led Potridge, Ward, 11th starter Valenti, Good and Kent Brewer. But the caution would fly for an Art Ball and Eric Devanna spin. The green flew for lap three followed by a quick caution for Randy Ryan. On the restart McCaughey led Potridge, Valenti, Ward, Brewer and Good. Valenti drove into second on lap four and drove around McCaughey for the lead a circuit later. Brewer would take third on lap seven and drive into second by lap 10. Valenti had built an eight second lead – half a lap – when the caution flew for Andy Earnhart who stopped on the track with four laps to go. That was the only thing to slow Valenti as he drove off the final four laps for the win over Brewer, a charging Matt Foos, McCaughey and Jimmy McGrath Jr. The UNOH All Stars and Fremont Speedway announced the series would return to Fremont Speedway for several big shows in 2015. Also, earlier in the day the Third Annual Fremont Speedway Kick-It Kickball Fundraiser was held. Along with raffles, a Kick-Bald event earlier in the year and other fund-raisers, over $50,000 was raised to fight childhood cancer. The Jeff Gordon Foundation will match that amount for a total over $100,000! Fremont Speedway will return to action Saturday, Sept. 27 for Kistler Racing Products Season Championship Night for the 410 and 305 sprints and dirt trucks. FREMONT, Ohio – Coming into the 32nd Annual Ohio Sprint Speedweek Dale Blaney had only one University of Northwestern Ohio All Star Circuit of Champions win, that coming in April. Now he wishes every week could be speedweek. “The Low Rider” took the lead from James McFadden on lap 42 and drove to his fourth win of speedweek and a $10,000 payday at Fremont Speedway on Ludwig Propane Night. Blaney NEVER finished out of the top two in the six speedweek events (3 nights were lost to rain). He now has 104 career All Star victories. It was his third win of the season at Fremont and he now has 22 career victories at “The Track That Action Built,” 16 of which are All Star wins. For Blaney, the week was worth around $30,000 in earnings. He and car owner Tony Kennedy agreed to donate $1,500 to the Kick-It Foundation to help combat childhood cancer. Fremont Speedway has a goal to raise at least $50,000 by September for the foundation. For Blaney, he becomes the first five time Ohio Sprint Speedweek champion (also in 1995, 2003, 2004, 2006 and 2014) and took a huge step in becoming the first five time UNOH All Star national champion. “We should have speedweek every week. I love coming to all these Ohio tracks…they’ve been really great to me and the fans have really been great to me and I appreciate it more than you know. My guys are awesome. George (Fisher, crew chief) is unbelievable right now. We’re working so good together and Tony has put together a great team and I’m the lucky guy who gets to drive this thing,” said Blaney of his Kennedy Cattle/Ti22 Performance/GF1 Chassis/Penske Shocks backed #14K. “Nobody’s won five Ohio Sprint Speedweek titles…that’s another notch to be up there with the likes of Frankie Kerr. I’m proud of the All Stars and teams and Rich Farmer has done a fantastic job with Fremont,” added Blaney. “I’ll go back to the drawing board to see what I can do different to beat that 14 car. It’s awesome to race with him…he’s probably my favorite driver and he also clean to race with. It’s cool to see another Australian up here (Jamie Veal finished third). It proves how good our racing is back home and hopefully some of these fans can come over and visit us,” added McFadden beside his Gaerte Engines/XYZ Machining/Red Line Oil/Hoosier Tires/All Star Performance backed machine. Veal had a coming out party for the Ohio crowd during speedweek, adding another podium finish. “I feel good to finish third especially against James and Dale Blaney, two of the best sprint car drivers in the world to race against. It was a pretty good week and I hope to keep it rolling over the next few weeks with the big races coming up,” said Veal beside his SWI Engineering #35AU. On Thursday John Ivy crashed his 305 sprint car and the crew had to spend the previous day thrashing to get a car ready for Saturday. The Fremont, Ohio driver rewarded the effort by holding off a hard-charging Bobby Clark to earn his first win of the season in the Fremont Federal Credit Union 305 Sprints. For Ivy, the track’s defending division champion, it is his 46th career Fremont win and he is sixth on the track’s all-time win list. “I was wondering what to do there with about five to go. I didn’t know whether I should stay here (on the bottom) or move up a little bit so I just let it roll up there a little bit. I think the tire started to seal up there at the end,” said Ivy beside his Fremont Fence/B&L Heating and Plumbing/Little Bar on the Prairie/Sonny’s Machining and Welding/Big D’s Pizza/Kistler Engines/Nagy Equipment Sales/Willey’s Towing/Kear’s Speed Shop backed machine. “I didn’t think we’d ever get here. I saw that caution come out there on lap 18 and I was saying to myself ‘I’ve been here before and I hope it doesn’t end up the same way.’ I have to thank Joey and my brother and big Kenny and everybody on this car. Those guys busted their busts yesterday to get this back together,” said Ivy in the Engine Pro Victory Lane. Not to be outdone by the exciting feature finishes, the AAA Ohio Auto Club Dirt Trucks put on a whale of a show. Shawn Valenti, who has eight wins at Fremont this season, and the track’s all-time winningest driver, Art Ball, had the fans on their feet the final four laps as they raced door to door. When the checkered flew, it was 75-year-old Ball in the Engine Pro Victory Lane for the second time this season and for the 76th time of his career at Fremont Speedway. “Honestly that was a whole lot of fun,” said a very happy Ball beside his Chaney Roofing/Distel’s Septic Service/Harley and Bev Lee/Ritzler Accounting/Faber Sub-Contracting/Lash Family Racing/Handy Graphix/TA Custom Cabinetry/Pierce Engineering backed truck. It was a restart with five laps to go when Ball went for the lead. “He (Valenti) wanted the top and I wanted the bottom and it worked. He always races clean and that’s what I like about Shawn. I have one more win than my age now and that means I can come back and not lose one if I don’t win a feature next year,” added Ball with a grin from ear to ear. McFadden and Danny Holtgraver brought the field of 24 to green for the 50-lap All Star feature. The race would stay green through the first 35 laps. McFadden took the lead over Holtgraver, Rob Chaney, Caleb Griffith, Brian Lay and Veal. Griffith would drive into third on lap two and around Holtgraver for second a lap later. With five laps in McFadden had a comfortable lead over Griffith, Holtgraver, Veal, Chaney, Lay, Chad Kemenah and 9th starter Blaney. As the leaders prepared to encounter heavy lapped traffic that was racing side by side by lap 15, Griffith closed on McFadden with Veal, Holtgraver, Chaney and Blaney in tow. McFadden picked his way through the lapped cars with Griffith and Veal locked in a great battle for second. Veal would take the runner-up spot on lap 19 but Griffith stayed close as the two battled back and forth over the next 8 laps. At the half-way point McFadden was unchallenged for the lead while Veal and Griffith continued to battle for second while Chaney was fighting with Blaney for fourth. Blaney, utilizing the bottom groove, would move into fourth on lap 26 and closed on Griffith two laps later, taking third on lap 29. With 15 laps to go McFadden, Veal and Blaney were locked in a tremendous race for the lead as they sliced through traffic. Max Stambaugh would stop on the back stretch on lap 36 to bring out the first caution. The restart order was McFadden, Veal, Blaney, Griffith and Chaney. When the green flew McFadden got an excellent restart with Blaney driving under Veal for second. But, Lee Jacobs would spin to necessitate another restart. After another lap was completed Brian Smith would spin. A lap and another caution when Byron Reed stopped on the track. So, with 10 laps to go, the restart order was McFadden, Blaney, Chaney (who had moved into third on the previous restart), Veal, Griffith, Holtgraver and D.J. Foos who had worked his way up from the 17th starting spot. Again McFadden would get a tremendous restart over Blaney. But, on lap 42 McFadden would make a small bobble in turns three and four and Blaney pounced, shooting to his outside to drive into the lead. Blaney could not shake McFadden as Veal and Chaney battled for third with Holtgraver, Griffith and Foos in tow. With three laps to go McFadden closed on Blaney but the Low Rider was able to fend off the challenge to take the win. Behind Blaney, McFadden and Veal at the finish were Chaney, Griffith, Foos, Holtgraver, Kemenah, Lay and Derek Hagar. In the 25-lap 305 sprint feature Ivy and Thursday night’s winner Paul Weaver brought the field to green with Ivy gaining the advantage over Weaver, Clark, Jimmy Colvin, Dustin Dinan and Josh Harrison. Brandon Moore would bring the caution out after one lap was recorded. On the restart Ivy pulled away from Weaver who had his hands full with Clark while Colvin, Dinan, Harrison, Jason Keckler, Nate Dussel and Alvin Roepke put on a show for fourth. The running order didn’t change much until the leaders caught the back of the pack by lap 10 but Kyle Peters would spin to give everyone a clear track. The restart order was Ivy, Weaver, Clark, Colvin, Dinan, Dussel, Roepke, Harrison, Jordan Ryan, Keckler and Seth Schneider. When the green flew so did Ivy. With nine laps to go Ivy led Weaver and Clark with the battle for fourth going on between Colvin, Dinan, Dussel and Roepke. Just as Clark passed Weaver for second, Peters would spin again, giving everyone a shot at Ivy. When the green flew Clark drove to Ivy’s outside with Weaver, Dinan, Roepke and Ryan in pursuit. With three laps to go Ivy and Clark were side by side. Coming to the white flag Ivy drifted up to block Clark’s advance as they exited turn four and that caused Clark to get a bad entry to turn one on the final lap. Ivy would drive to the win over Clark, Weaver, Dinan and Ryan. Matt Foos and Valenti brought the field to green for the 20-lap AAA Ohio Auto Club Dirt Truck feature and right away the crowd new they were in for a thriller as Foos, Valenti, Cory Ward and Ball raced side by side and nose to tail for the lead. However, after a lap was completed Andrew Lutman stopped on the track for a caution. When the green flew the quartet of Foos, Valenti, Ward and Ball continued their battle. After Foos led by a bumper the first three laps, Valenti would slip by and begin to pull away as Foos, Ward and Ball continued to battle for second. Ball would finally take the second spot on lap 14 as they raced into lapped traffic. Kent Brewer would stop in turn one on lap 15 to set up a fantastic finish. The restart order was Valenti, Ball, Foos, Ward, Jimmy McGrath Jr., Brad Keckler and Jim McGrath Sr. When the green flew Valenti went to the top with Ball racing to his inside. The pair raced door to door over the next three laps. As they raced to the white flag Ball drove under Valenti to lead by a bumper with Ward getting around Foos. Valenti would bobble ever so slightly in turn two on the final lap, giving Ball an advantage. However, as they raced into the final two corners, Valenti regained his momentum and it was a drag race to the checkers. Ball would win by less than half a truck length over Valenti with Ward, McGrath Jr. and Foos rounding out the top five. Fremont Speedway will be back in action Saturday, July 5 on Miller Rigging Night. It will be a Classic Car Cruise-In Night as well with fans encouraged to bring their classic cars out to put on display. It will be a Kistler Racing Products FAST (Fremont Attica Sprint Title) Championship Series event for the 410 sprints which will reward the champion with a $10,000 payday at the end of the season. The 305 sprints and dirt trucks will also be in action. LIMA, Ohio (Friday, June 27, 2014) – Dale Blaney won his 100th career University of All Star Circuit of Champions feature in April. He was held winless until the 32nd Annual Ohio Sprint Speedweek. On Friday “The Low Rider” recorded his third win out of the five speedweek events including Friday’s stop at Limaland Motorsports Park. Blaney inherited the lead when Jamie Veal smacked the front stretch wall on lap 27 and went on to record his 103rd career UNOH All Star victory. It was Blaney’s fourth series win of 2014 and he now has five All Star wins at Limaland. “We had a good car. It didn’t take off the best but I knew we were going to have a good car by 40 laps. We kind of picked our way and I saw where they were running and the car got better and better. I can’t say enough about Tony (Kennedy, car owner). He’s put together a great team and we’re having some fun. George (Fisher, crew chief) is focused as I’ve ever seen him,” said Blaney beside his Kennedy Cattle/Ti22 Performance/GF1 Chassis/Penske Shocks/Tom’s Sewer and Septic Service backed machine. “I’ve made so many laps around here and I know the track’s going to move. I knew when I had to get up on the track and to the middle. The guys give me a great car and it’s second nature for me to go do those spots,” added Blaney. Greg Wilson, who started in the fourth row next to Blaney, would close on Blaney late in traffic, but had to settle for second. “But, as long as we good here in a couple of weeks at the Doty (Brad Doty Classic on July 9)…we want to win that race. That’s pretty important to us. I want to really thank all the fans for coming out here and paying the prices to come and watch us race. I’m a blessed man to get to do this with my girls and my wife and it’s damn good to be standing on the front stretch,” added Wilson. Byron Reed would finish third and considering how up and down his year has been, this may be the shot in the arm his team needed. Friday’s Ohio Sprint Speedweek visit was the 29th appearance at Limaland for the UNOH All Star Circuit of Champions. The field of 45 cars was narrowed to the 24-car starting field for the 40-lap feature with Duane Zablocki and Stevie Smith comprising the front row. When the green flew Zablocki would jump to the lead over Smith, Jamie Veal, Rob Chaney, Travis Philo, Reed and Blaney. Veal would grab second on lap 2 and immediately pressured Zablocki for the top spot. Veal would slide in front of Zablocki on lap five before the caution flew for Paul May. On the ensuing restart Veal led Zablocki, Chaney, Reed, Philo, Smith and Blaney. After a lap was completed Ronnie Blair would stop with suspension damage. On the restart Sheldon Haudenschild and Derek Hagar would get together for another caution. When the green flew so did Veal as he pulled away from a tremendous battle for second between Zablocki, Reed, Chaney and Philo with Blaney staying close. Reed would take second on lap 10 with Chaney and Philo also getting around Zablocki. Blaney would move into fifth by lap 11 with Veal pulling away from Reed with Chaney and Philo having a great battle for third. Philo would gain the position on lap 14. By lap 15 the leaders were approaching heavy lapped traffic and Reed closed quickly on Veal with Philo third and Blaney in fourth. At the half-way point lapped cars were really coming into play with Veal leading Reed, Philo, Blaney, James McFadden, Wilson, Chaney and Smith. Before Reed could try to get to Veal, Philo would challenge him for second and with 15 laps to go it was a tremendous three car battle for second with Blaney joining in. McFadden and Wilson would also close on the leaders. Blaney would drive by Phil for third on lap 26 and ran beside Reed for second. As the leaders came off turn four to complete lap 27 Veal bounced off the outside retaining wall as Blaney shot below to steal the lead. Veal would stop on the front stretch, ending his great run. The restart order was Blaney, Reed, Philo, McFadden, Wilson, Chaney and Smith. When the green flew so did Blaney as Reed tried to stay close. Meanwhile Philo had his hands full with McFadden and Wilson as the trio traded sliders. Wilson would move into third with 10 laps to go. Reed slowly ate into Blaney’s lead as Wilson also closed and with four laps to go Wilson ducked under Reed to take second. Wilson closed to within two car lengths of Blaney but ran out of time as “The Low Rider” drive to the win. Behind Blaney, Wilson and Reed were Philo and McFadden to round out the top five. In the five Ohio Sprint Speedweek events, Blaney has not finished outside of the top two as he looks to wrap up his fifth speedweek title at the finale at Fremont Saturday. Blaney’s three Ohio Speedweek wins also puts him in a very good position to become the first ever five time UNOH All Star national champion. FREMONT, Ohio – Fremont Speedway was Dale Blaney’s personal ATM in 2013. But, after opening the track’s season with a win in April, “The Low Rider” has been held winless at “The Track That Action Built.” That all changed Thursday during night #4 of the 32nd Annual Ohio Sprint Speedweek with the University of Northwestern Ohio All Star Circuit of Champions. The four time and defending UNOH All Star Champion took a major step to claiming an unprecedented fifth series title by blasting past James McFadden on a restart at the half-way point of the feature and driving to his second Ohio Sprint Speedweek win. The victory is Blaney’s 102nd career UNOH All Star win and the third series victory of 2014. He now has 21 career victories at Fremont, of which, 15 have been All Star triumphs. Blaney now holds a commanding lead in the Ohio Sprint Speedweek point standings as he looks to claim that title for the fifth time in his career. In fact, he has not finished out of the top three in any of the four speedweek events. He also pads his point lead in the UNOH All Star’s national and Ohio region points. “I was really really tight entering the corners. Him (McFadden) in front of me…it had me all balled up. I was able to get a good run on him in one and two and in three he saw me and he had been running down and he caught it and I got around him and moved to the top. The car got really good the last 12 laps. I was able to get off two really well,” said Blaney beside his Kennedy Cattle/Penske Shocks/Ti22 Performance/GF1 Chassis #14k. “George and Tony and Donny and Skippy…they do an awesome job with this thing. It’s such a pleasure for me to drive this right now. Those guys do 80 percent of the work and the credit should go to them…I just get to drive it,” added Blaney in the Engine Pro Victory Lane. For McFadden, Fremont Speedway has been fantastic to the Australian driver as he scored a $10,000-to-win victory back in May at the track and followed with a second place run Thursday on “I’m Your Guy Water Proofing Night.” The battle he had with Jac Haudenschild for second the last hand full of laps kept the big crowd entertained to say the least. “I really like this track…it’s a lot like home. The track’s a little bit flatter but slicker than I’m used to. The team gave me an awesome car and it’s a pleasure to drive and it’s easy to get around here,” said McFadden beside his Tim Norman/Joe Gaerte owned #3G. “It is always fun racing with someone like Jac. I probably used him up a little too much coming into three…didn’t expect to move up as much as I did…it kind of got away from me and I’m sorry about that. But, this gives us a lot of momentum going into the last two races,” added McFadden beside his Gaerte Engines/XYZ Machining/Red Line Oil/All Star Performance backed machine. Haudenschild, who won the speedweek event the previous night at Atomic Speedway, is happy with the direction of his Rick Rodgers backed team. “James and I had a real good race there…we slid back and forth a couple of times. That was fun. We’re getting better here and I’m looking forward to coming back here in a couple of days. I said it about a month ago…this team is starting to gel,” said Haudenschild beside his Mondak Portables/Triple X Racing/Renegade Rentals/Champion Oil/Destiny Racing backed #9w. In a crash marred Fremont Federal Credit Union 305 Sprint feature, Fremont’s Paul Weaver would hold off Steve Rando for his first win of the season. The victory is Weaver’s 34th career win at the track and ties him with Al Franks for 10th on the track’s all-time win list. It wasn’t easy for Weaver, who said he ran out of fuel on the last lap. “I ran out of fuel but I’m sure others did too. It just wouldn’t go down the straight away and we were slipping and sliding. I couldn’t find a good way into one. It was almost like close your eyes and where it ends up it ends up. We have been doing everything we could and Jamie Miller came along to help me including putting another car together. We put this one back together and right off the bat we win,” said Weaver beside his Hampshire Racing Engines/Buckeye Mobile Coatings/Weaver Performance Karts and Parts/Fostoria Mod Shop/M&L Excavating/Tender Touch Car Wash backed machine. In the AAA Ohio Auto Club Dirt Trucks, Risingsun, Ohio’s Shawn Valenti battled the first half of the race with Art Ball and Matt Foos and then with Jimmy McGrath Jr. At the end, he held off a charging Daniel Roepke to score his 8th win of the season at Fremont. The victory is his 17th career win at the track. “I have to thank Joe and Mike Burkin for putting me in their sprint car tonight and Jeff Babcock for this awesome truck. The truck is rolling the cushion nice,” said Valenti beside his Craig Miller Trucking/Conrad Transport/Dave Story Equipment Repair/Day Dream and Memories Crafts and Antiques/KS Sales and Service backed #7b. After the field of 51 UNOH All Star Sprint Cars – second highest car count of the week – was whittled down to the 24-car starting grid for the 40-lap feature, McFadden and Lee Jacobs would make up the front row. Jacobs, who holds the track record at Fremont Speedway, would bolt into the lead over McFadden, Blaney, Gary Taylor, Cap Henry and Haudenschild. Jacobs set a blistering pace, hitting lapped traffic by the 7th circuit with McFadden, Blaney and Taylor closing. Taylor would use the lapped cars to steal third on lap 8. As Jacobs and McFadden tried to negotiate through the traffic, Taylor and Blaney closed. As Jacobs tried to maintain the lead and get around the lapped car of Brandon Wimmer, the two touched wheels with Jacobs slamming into the front stretch wall, ending his night and handing the lead to McFadden. Taylor too would suffer a flat tire and relinquished his second running spot to Blaney. The restart order was McFadden, Blaney, Henry, Haudenschild, Christopher Bell, Chad Kemenah and Randy Hannagan. Haudenschild would move into third on lap 13 with Bell taking fourth by lap 16, bringing Kemenah to fifth. Travis Philo would spin on lap 19 to bunch up the field and on the restart; Blaney drove around the high side of McFadden in turns one and two to grab the lead. Just past the half-way point the running order was Blaney, McFadden, Haudenschild, Kemenah, Bell and Henry. The car on the move was Chris Andrews who started 19th and was up to 7th by lap 24. With 11 laps remaining both McFadden and Haudenschild were closing on Blaney with Kemenah fourth and Andrews fifth. The final caution would fly with five laps to go when Broc Martin spun. With a clear track Blaney would drive away as McFadden and Haudenschild put on a heck of a show battling for second with Andrews grabbing fourth. Haudenschild would move into second on lap 37 but McFadden squeezed back by a circuit later. At the checkered it was Blaney over McFadden, Haudenschild, Andrews and Kemenah. As a way to thank the teams for supporting Fremont Speedway during the Ohio Sprint Speedweek event, track promoter Rich Farmer added extra funds to the B-main. Rookie Kyle Capodice and Weaver would bring the field to green for the 25-lap 305 sprint feature with Weaver gaining the advantage over Capodice, Steve Rando, Nate Dussel, Dan McCarron, Alvin Roepke, Dan Hammond and John Ivy. The action ground to a half on lap three when Jordan Ryan tipped over in turn two. The restart order was Weaver, Capodice, Rando, Dussel, Roepke, McCarron, Ivy and Seth Schneider. Rando would take charge of second on lap five, bringing Dussel and Roepke around Capodice. Roepke would bring out the caution on lap 11 when he found one of the infield tractor tires, ending his night. On the restart Ivy was able to drive around Dussel for third. On lap 13 one of the infield tractor tires was moved into the racing groove to bring out the caution. On the restart Brandon Moore would spin. When the green came back out the running order was Weaver, Rando, Ivy, Dussel and Dustin Dinan. Dan Hammond would spin on lap 15 for another caution. When the green flew again it didn’t hold for too long as Dustin Stroup and Ricky Peterson would tangle on the front stretch necessitating a red. On the ensuing restart Capodice would spin. After lap 19 was recorded with the running order Weaver, Rando, Ivy, Dussel, Dinan and Schneider, McCarron would spin. On the ensuing restart Dussel and Ivy would collide, sending both upside down. Now the restart order was Weaver, Rando, Dinan, Schneider, Jimmy Colvin, TJ Michael and Bobby Clark. Weaver and Rando pulled away from Dinan and it looked as if Weaver had the race in hand. But, on the final corner of the final lap, his car bobbled slightly and Rando drove to his inside as it was a drag race to the checkers. Weaver held on to win over Rando, Dinan, Schneider and Michael. Brandon Moore took the Baumann Auto Group Big Bucks Bump Challenge and left his front row starting spot to go to the tail for a chance at a $5,000 bonus. He would come up short, finishing 10th. But, because he accepted the challenge, his 10th spot pay was doubled. Art Ball and Matt Foos would bring the field to green for the 20-lap dirt truck feature. Right away it was a tremendous three truck battle between Ball, Foos and Valenti. The caution would fly on lap 3 when Brad Keckler tangled with Foos who had gotten a bit sideways in turn three. That handed the lead to Ball with Valenti and Jimmy McGrath locked in a battle for second. Ball, McGrath and Valenti now raced hard for the lead with Roepke and Kent Brewer in tow. McGrath Jr. would take the lead on lap six with Valenti and Ball glued to his bumper. Valenti would drive into second on lap eight and blasted around McGrath for the lead a circuit later. At the half-way point the running order was Valenti, McGrath Jr., Ball, Roepke, Brewer and Cory Ward. Ball would spin on lap 16, handing third to Roepke who would then drive around McGrath on lap 18. Brandon Leighton would spin on lap 19, setting up a one-lap dash to the checkers. Valenti would hold off Roepke with McGrath Jr., Brewer and Ward rounding out the top five. CHILLICOTHE, Ohio (Wednesday, June 25, 2014) – Jac Haudenschild lived up to his nickname “The Wild Child” at Atomic Speedway Wednesday night. The Wooster, Ohio driver blasted around Dale Blaney with five laps to go and went on to score the win on night #3 of the 32nd Annual Ohio Sprint Speedweek with the University of Northwestern Ohio All Star Circuit of Champions. Haudenschild used the concrete wall in turns three and four as a cushion to rim-ride to his second All Star win of 2014. It is his 28th career series victory. “That was really fun. The track was awesome. The fastest way was around the top. I was running up there pretty high. It was a little easier running second. Dale was definitely fast but I was able to see his line and we got there at the end,” said Haudenschild beside his Destiny Racing/Rick Rogers Construction/Mondak Portables/Triple X Racing/Renegade Rentals/Champion Oil backed machine. “We’ve been getting better every week and hopefully we can keep it up. The car is feeling good and the guys have worked their tails off,” added Haudenschild. For Blaney, who came into the night leading the UNOH All Star national and Ohio Region points and the 2014 Ohio Sprint Speedweek points, it was another solid night with a second place finish despite leading the first 25 laps. “It was my mistake. I moved to the middle there a little bit. It almost felt like it was starting to lock down there in the middle and I probably ran a little too conservative there to try and stay in it. He just got a run on me there and after that he was running pretty hard. My mistake for running a little too easy in one and two and being conservative. The guys gave me a great car and I just brought it home in second. Every night we’ve been really good and put ourselves in a good position and that’s what it takes,” said Blaney beside his Kennedy Cattle/GF1 Chassis/Ti22 Performance/Penske Shocks backed #14K. Randy Hannagan would battle with Blaney for the runner-up position the final four laps before coming home in third. After the 62-car field was whittled down to the final 24 A-main starters it would be Blaney and Sheldon Haudenschild who would bring the field to the green for the 30-lap feature. Blaney would grab the lead over Sheldon Haudenschild, Cole Duncan, Jac Haudenschild, Taylor Ferns, Danny Smith, Randy Hannagan, Brady Bacon and Caleb Griffith. Jac Haudenschild would grab third on lap two. It didn’t take the leaders long to find heavy lapped traffic by lap five but the action would grind to a halt on lap six when Cale Thomas would blow a right rear tire and get into the front stretch wall, getting upside down. On the restart Blaney pulled away slightly as the son and feather battled for second. Jac would take the runner-up spot on lap eight, bringing Duncan into third with Sheldon, Hannagan, Smith and Shane Stewart in tow. Blaney would find lapped traffic by the 12th circuit with Haudenschild staying within striking distance while Duncan battled with Hannagan with Sheldon Haudenschild, Smith and Griffith in pursuit. Jimmy Stinson would spin to bring out the caution on lap 14 and once again hand the leaders a clear track. Blaney and Jac Haudenschild would pull away from the field and run nose to tail with Duncan, Hannagan, Sheldon Haudenschild, Smith, Griffith, Stewart and Bacon in tow. Bacon would spin in turn one on lap 21 to once again give the leaders a clean track. On the restart once again Blaney and Jac Haudenschild were glued together and pulled away while Duncan was battling with Hannagan for third. Jac would execute a perfect slider on Blaney in turns three and four to take the lead with five laps to go when the red flew for a pile-up involving Christopher Bell, Danny Holtgraver and Cory Crabtree. On the restart Jac Haudenschild would continue to blast away at the extreme top edge of the track with Blaney now locked in a battle for second with Hannagan while Sheldon Haudenschild was battling with Griffith for fourth. Jac Haudenschild would drive to the win with Blaney edging Hannagan for second while Griffith and Sheldon Haudenschild rounded out the top five. ATTICA, Ohio – Dale Blaney rewarded his new car owner with a $10,000 victory Saturday to open Attica Raceway Park’s 2014 season. “The Low Rider” led all 40 laps of the HD Supply/Construction Equipment and Supply Spring Nationals to score his 100th career University of Northwestern Ohio All Star Circuit of Champions win. It wasn’t easy for Blaney, as reminiscent of the 2012 Spring Nationals when he and Craig Mintz put on an exciting show for the two nights, Mintz again challenged Blaney late. But, Blaney came alive the final seven circuits to score the win aboard his Tony Kennedy owned #14h. The victory is Blaney’s 18th career win at Attica of which 14 have been UNOH All Star triumphs. “We were really good on the short runs. I really wasn’t that great after about 10 laps. I kind of got stuck behind Sebetto (Bryan) and he and Chris Bell were racing. I saw the 09 beside me in one and two and I knew where he was running at so I just picked the pace up a little bit and was really, really fortunate to go down into three and Chris Bell moved to the middle and it left me with the bottom and after that I was running like a scared dog. Craig (Mintz) runs really good here so to get that one is cool,” added Blaney, a four time and defending UNOH All Star champion. In the Summit Racing Equipment UMP Late Model main Ashland, Ohio’s Ryan Markham held off several challenges from Rusty Schlenk and Chris Keller to score his second career Attica victory. “I wanted to get into lapped traffic and kind of weasel my way through there. I think my car was pretty good on the bottom but I wanted to keep it up top to keep an eye on them on my inside,” said Markham beside his H & T Demolitions/Fultz Fabrications/Accu-Force Shocks/Innovative Graphics backed #5m. “When you’re up there flirting with that cushion you don’t want to push it too hard but when a guy shows you his nose you have to give it everything you got. That was a pretty good race…two and three wide. My wife is going to be mad…it was too cold for her to come,” joked Markham. John Ivy made a daring move late in the 25 lap Foster’s Auto Body 305 Sprint feature, splitting two lapped cars in turn one while holding off Jordan Ryan. Ivy would lead all 25 laps to score his 12th career Attica 305 sprint win. With seven laps to go, Blaney was in heavy lapped traffic and Mintz closed quickly. On lap 34 Mintz drove to Blaney’s outside in turns one and two, but Blaney was able to hold him off and then picked up the pace to pull away fro the win. Mintz, Shaffer, Holtgraver and Jacobs – who flipped hard in his heat race – would round out the top five. Cody Scott and Markham brought the field to the green in the 25-lap late model main with Markham taking the lead while Schlenk drove into second while Chris Keller, Scott and Matt Irey gave chase. With just four laps in, Schlenk continually challenged Markham for the lead, driving to his inside lap after lap. As the leaders hit lapped traffic on lap 7, Keller now joined the fun. The caution flew on lap 7 for a Jeremy Canada and Josh Haynes tangle. On the restart Haynes would get into Doug Baird, necessitating another restart. Markham would get an excellent jump when the green flew as Schlenk had his hands full with Keller while Irey, Dona Marcoullier, Scott and Eric Spangler gave chase. A Canada spin on lap nine stopped the tremendous battle up front. But when the green reappeared, so did the fight for the lead with Markham, Schlenk, Keller and now Marcoullier. The side-by-side and often times three-wide battle up front continued as the leaders raced into traffic again by lap 16. Keller would take second a circuit later and immediately drove to Markham’s inside. But, the caution would fly one final time on lap 18 when Jeff Babcock tangled with the lapped machine of Baird. When the green flew again, Keller dove to Markham’s inside but couldn’t make the pass as Schlenk again joined the battle. But, with three laps to go Markham began to pull away slightly and went on to score the victory. Schlenk would rebound for second followed by Keller, Marcoullier and Irey. John Ivy and Bobby Clark brought the field to the green in the 25 lap 305 sprint main with Ivy immediately grabbing the advantage. Clark, Jordan Ryan, Dan McCarron, Seth Schneider, Brandon Moore and Jason Keckler gave chase. Ryan would move into second on lap three and started to real in Ivy as they raced into lapped traffic by the 9th circuit. On lap 11 Clark would tangle with the lapped machine of Jim Taddeo, bringing out the caution and ending Clark’s night. After the green flew and a lap later, Nate Dussel would end up on his side, collecting Dan Hammond. On the ensuing restart Ivy pulled away slightly from Ryan with McCarron, Keckler, Paul Weaver and Schneider in pursuit. Keckler would grab third on lap13, bringing Weaver into fourth. Things would get very interesting on lap 21 as the leaders found lapped traffic. This allowed Ryan to move right in on Ivy’s rear bumper. Ivy was hung up behind two lapped cars who were battling as they flew into turn one with two laps to go. Ivy split the lapped cars as Ryan had to back off the throttle. Ivy would hold off Ryan for the win while Keckler, Weaver and McCarron rounded out the top five. Attica Raceway Park will be back in action on Friday, April 11th on Bazel Race Fuel Night with the UMP Late Models, 305 sprints and dirt trucks in action. 1. 91-Rusty Schlenk ; 2. OO-Chris Keller ; 3. 92-Cody Scott ; 4. 16-Steve Sabo ; 5. 23C-Jeremy Canada ; 6. 34-Ky Harper ; 7. J4-John Garvin Jr.